port for longer port to pass through the blast area. Ports can be located on one or both doors. This system was developed for an (AR15) Barrel Manufacture. Auto Rotating Table – Twelve (12) Stations. close the door and manually blast treat. 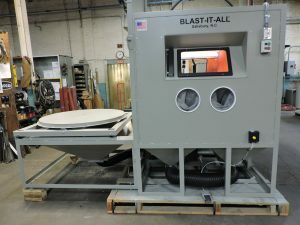 The table is rotated by a manual foot switch as the operator needs for blasting. While the door is open, the table will not rotate the individual stations. Reverse Pulse Cleaning Dust Collector. 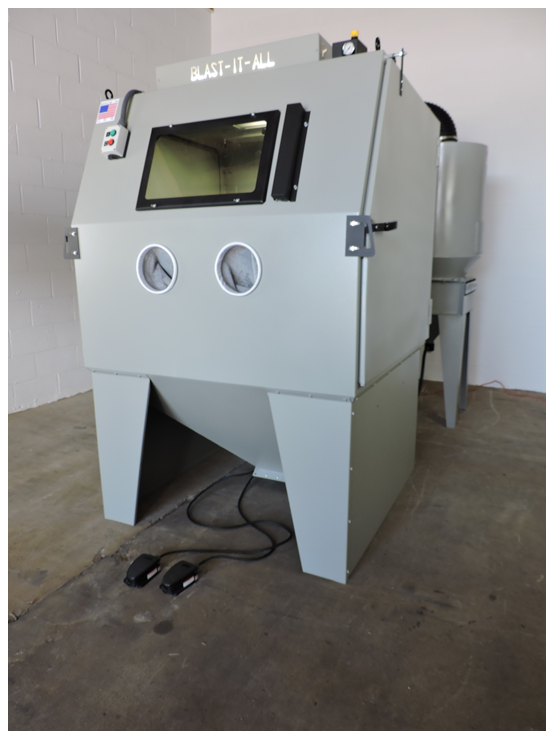 If you need a larger blast enclosure, but not a blast room, the CUBE system may suit your needs. The CUBE is fabricated, starting with an angle iron frame and skinned with 12 gauge high grade steel. The inside dimensions of the BIA 60 CUBE are: 60″ Wide X 60″ Deep X 53″ Tall (nominal). BLAST-IT-ALL® developed and provides quick change 10” diameter SNAP-IN abrasive resistant gloves. 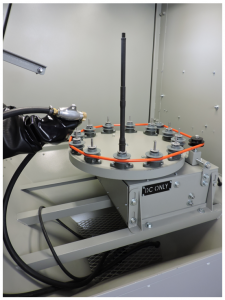 Gloves are changed from outside the cabinet, no clamp required. The lighting is by a four tube, T8 fixture above the work area, and protected by ¼” Plexiglass. Standard, quick change viewing window is 12 ½” x 20 ½” with roll MYLAR window protector. 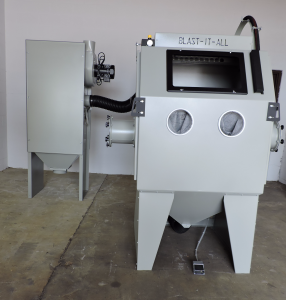 Various combinations of recovery reclaim and dust collectors are available, depending on application.